Despite announcements of several road and metro projects, Mumbai’s property market plateaued under the weight of rising construction costs, demand-supply mismatch and snail-paced infrastructural growth. While keeping buyers at bay, these factors impelled the realty graph of the financial capital to dip insignificantly from the Jul-Sep quarter to Oct-Dec 2015. With the exception of the south west localities, the property landscape of the Mumbai Metropolitan Region (MMR) has delineated a downturn, as a result of lofty price tags. Navi Mumbai added yet another feather to its cap with the City and Industrial Development Corporation (CIDCO) launching Maharashtra’s first smart city project. The frequent policy changes in Thane’s real estate market and habitual stonewalling of core stakeholders when drafting vital industry guidelines, dampened developers’ sentiments. Focussed on improving the metro connectivity in the region, the Maharashtra government announced completion of the Seepz-Kanjur Marg line by 2018, the Andheri (E)-Dahisar (E) and Dahisar-DN Nagar lines by 2019, and the Colaba-Bandra-SEEPZ stretch by 2022. In addition, the highway infrastructure is set to receive a massive fillip with the state government planning to pump Rs 28,000 crore in 21 projects spanning 1,500 km, in 2016. Taking a colossal step towards promoting real estate transparency, the state government would grant new building permissions and conduct concurrent audits via e-platform starting January 2, 2016. In lieu of slashing property prices, developers condensed apartment sizes to maintain affordability. Flat sizes in the city have been reduced by 26.4 per cent between 2010 and 2015. Competitive rental rates have steered IT firms towards Navi Mumbai, leaving MMR to be dominated by the banking, financial services and insurance (BFSI) sector. In fact, over 75 per cent of Navi Mumbai‘s office landscape is occupied by IT/ITeS firms. The downhill trajectory from a trifling growth of one per cent in Jul-Sep 2015, to stagnancy in Oct-Dec 2015, is attributed to the prodigious gap between a household’s average annual income in Mumbai (around Rs 7.5 lakh per annum) and the price of inventory in MMR (Rs 1 crore and above). 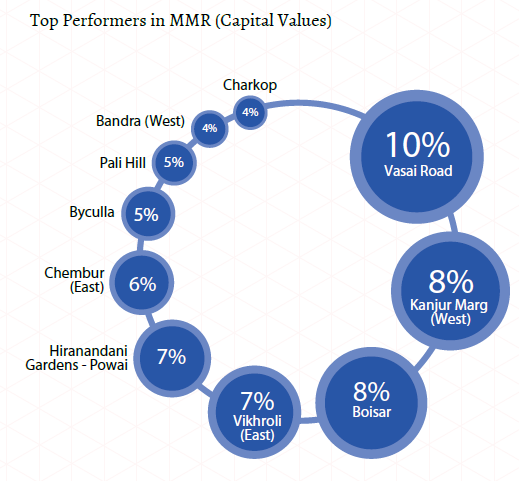 Vasai Road, a locality beyond Mira Road, saw capital values clocking a surge of 10 per cent in Oct-Dec 2015, the highest in MMR. The locality’s growth is being attributed to the possibility of enhancement in rail infrastructure. Vasai Road was followed by another locality beyond Mira Road, Boisar; and Kanjur Marg (West) in Central Mumbai suburbs, each of which recorded an average rise of eight per cent. The peripheral industrial town of Boisar enjoyed the advantage of being a low-cost area. The locality offers affordable housing inventory from reputed builders. Properties here are priced around Rs 3,500 per sq ft, vis-à-vis the five digit price tags in the central locales of Mumbai. Kanjur Marg (West) owes its escalating values to the recent improvement in rail infrastructure and the Mumbai Metro Rail Corporation (MMRC) prioritising Seepz-Kanjur Marg Metro corridor. Anticipation of a 40 km metro route, connecting Wadala- Ghatkopar-Thane-Kasarvadavali, infused cheer in Wadala. However, the persistent delay in infra development led to the realty graph plummeting by three per cent this quarter. The residential rental landscape of MMR had a successful story to narrate. The average values climbed by a notable margin of four per cent in Oct-Dec 2015, as compared to the same quarter in 2014. Sakinaka in Andheri East clocked an enormous rise of 17 per cent in rental values, year-on-year, on the back of metro connectivity. In fact, the Andheri to Sakinaka metro corridor is one of the most popular routes, which witnesses an average of over 25,500 commuters per day. 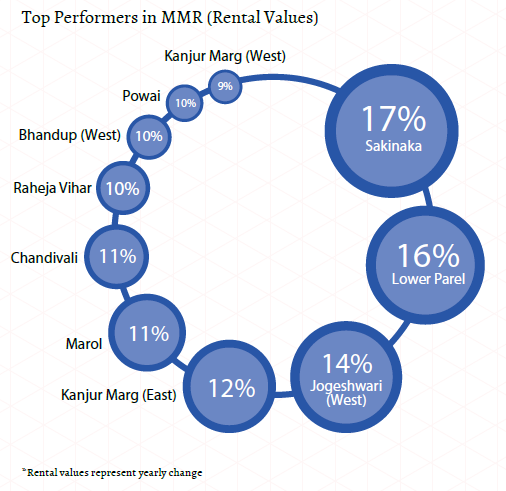 One of the biggest employment generating locales of Mumbai, Lower Parel, followed Sakinaka closely, with a rental appreciation of 16 per cent in the same time frame. Even capital sentiments in this locality have lifted due to the Brihanmumbai Municipal Corporation’s (BMC) endeavour to transform the area into a smart city. Jogeshwari (West), where average rental values in the last one year escalated to the tune of 14 per cent, had the connecting bridge between the locale and Goregaon (East) to thank, which eased traffic flow greatly and reduced bottlenecks at peak commutation hours between the east-west regions. Rental rates in Chandivali and Powai in the Central Mumbai suburbs witnessed a decent jump of 12 per cent between Oct-Dec 2014 and 2015. The growth in values is attributed to the excellent connectivity to the east-west suburbs facilitated by the Jogeshwari-Vikhroli Link Road (JVLR) and the LBS Marg. Replicating last quarter’s growth trajectory, the real estate landscape of Navi Mumbai offered some breather after the grimness elucidated by MMR. 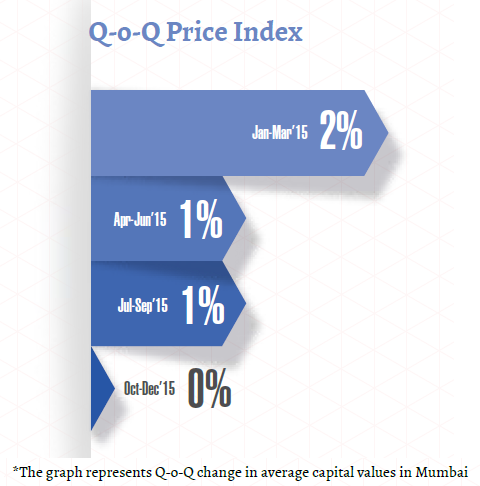 The market clocked a growth of two per cent in Oct-Dec 2015, vis-à-vis the preceding quarter. In addition to the ongoing Navi Mumbai Airport Influence Notified Area (NAINA), the city has another achievement to boast – CIDCO’s smart city project. Maharashtra is slated to witness its first smart city situated in Navi Mumbai by 2019, for which the agency has proposed a total investment of Rs 34,777 crore. Although the Navi Mumbai International Airport continues to remain embroiled in legal controversies with the forest department at Alibag, it has definitely proffered hope to the micro-markets of Ulwe, Kharghar and Kamothe. These localities recorded a spike in average capital values by four per cent, three per cent and one per cent, respectively. Sharing a similar fate as that of the airport, the Navi Mumbai metro project also features in the list of delayed and controversial infrastructure projects in Mumbai. However, this project has sustained realty sentiments in Kharghar and Taloja, which recorded a growth of four per cent between the last two quaters of 2015. Average capital values in Sector-36, Kharghar, which houses CIDCO’s affordable residential project under the Swapnapurti Scheme, plunged by five per cent quarterly. Despite targeting the Economically Weaker Sections (EWS) and Low Income Groups (LIG), the agency offered units at Rs 5,124 per sq ft, which is approximately same as the ongoing market price (Rs 4,500 - Rs 5,500 per sq ft). 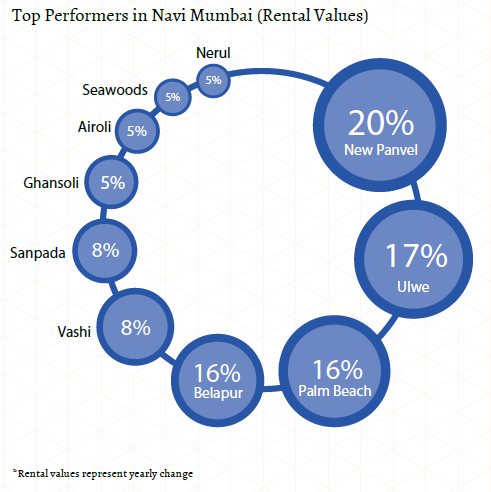 A year-on-year study revealed that Navi Mumbai’s rental market witnessed an unanticipated growth of seven per cent in Oct-Dec 2015 over the same quarter last year. A substantial extent of credit for this surge goes to the presence of IT/ITeS firms, which were instrumental in attracting workforce, thus increasing demand for houses on rent. Boasting of a rise of 20 per cent, New Panvel contributed significantly to the landscape’s growth. However, the surge does not come as a surprise since the region has strong civic infrastructure and is well-connected to Mumbai and other parts of the state via a network of roads, namely, the Mumbai-Pune Expressway and the Uran-Panvel Road. Since the area is located at an easy distance of 11 km from the Navi Mumbai Airport, it will continue being one of the preferred localities of the tenant community in the city. Ulwe recorded a jump of 17 per cent in rental values in Oct-Dec 2015, vis-à-vis 2014. With the state government of Maharashtra adopting the ‘Housing for All’ scheme and aiming to build 19 lakh low-priced houses by 2022, the comparatively affordable market of Ulwe has come to the fore. Reasonably-priced properties translate into lower rentals. The locality is expected to see better times ahead with the development of three special economic zones (SEZ) by Reliance Industries. Belapur witnessed a rental growth of 16 per cent in the last one year. The broadening of the Sion-Panvel Expressway from four to six lanes helped the locality to become popular among the tenant community. Despite a slew of infrastructure improvements such as Wadala-Ghatkopar-Thane metro corridor, Thane’s property landscape emulated MMR’s story and remained stagnant in Oct-Dec 2015, after clocking a minimal growth in the Jul-Sep quarter last year. Patlipada’s real estate grew from three per cent in the previous quarter to six per cent in Oct-Dec 2015. Its proximity to Hiranandani Estate proves to be an advantage for the locality. 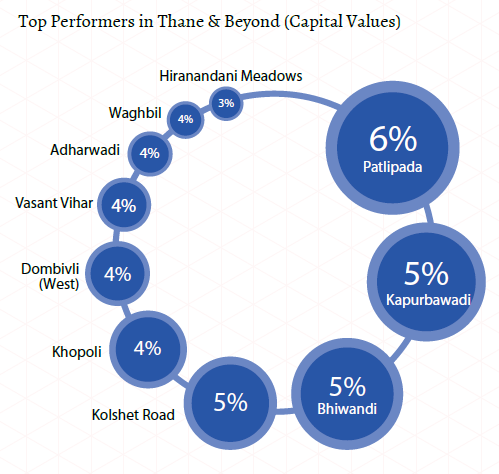 Although it continued to hold its position in the list of top performers in Thane, Kapurbawdi’s capital sentiments flagged from seven per cent in Jul-Sep 2015 to five per cent in Oct-Dec 2015. Bhiwandi and Kolshet Road, too, witnessed property prices rising by the same margin. Kapurbawadi owes its growth to its strategic location and a number of big ticket projects in the vicinity. Situated at a convergence from which roads lead to Pokhran Road No. 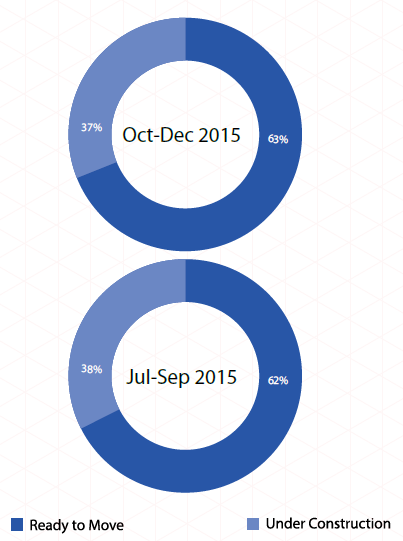 2, Majiwada registered an average capital rise of three per cent in Oct-Dec 2015 vs. the preceding quarter. Replicating Kapurbawadi’s claim to fame, Bhiwandi, too, is home to several new project launches, resulting in an average capital appreciation of five per cent in Oct-Dec as against the quarter ending September 2015. Builder sentiments in Thane were dulled by the frequent alterations in housing policies. The fraternity complained of stakeholders being kept in the dark during the formulation of vital industry guidelines. To this end, builders sought a digitised process for project approvals. Maintaining its growth pace on the rental charts, Thane clocked an average rise of four per cent between Oct-Dec 2014 and 2015. The state government’s endeavour to improve road and civic infrastructure in the region, coupled with the affordability quotient, sustained sentiments. Anand Nagar’s rental landscape witnessed a remarkable hike of 10 per cent in Oct-Dec 2015, vis-à-vis the same quarter last year. The locality owns its rental demand to its strategic location at a cross junction road, which facilitates quick travel to Kolshet Road via the locality. Furthermore, the Thane Municipal Corporation proposed the construction of a foot overbridge along the Eastern Express Highway to ease travel for cyclists and pedestrians. Rents in Pokharan Road recorded a rental hike of 10 per cent in the last one year. The long-pending issue of broadening Pokharan Road No.1, which will ease bottlenecks at Vartak Nagar junctions, has added to the rental flavour of the locality. Hiranandani Estate, which saw values escalating by nine per cent during the tracked time span, draws its demand from its excellent civic amenities, such as clean roads and educational facilities. Being easily accessible via the Ghodbunder Road and housing the Hiranandani Business Park has proven advantageous for the locality. Recently, Tata Consultancy Services rented over two million sq ft of office space for 15 years. While demand in the luxury and ultra-luxury segments continued to remain weak, surging land and construction costs prevented builders from reducing prices within the MMR. Thanks to the state government’s endeavour to improve connectivity between Mumbai and its peripheral regions and low land costs, activity in the affordable segment heightened significantly in Navi Mumbai and Thane in Oct-Dec 2015. As expected, the city which exemplifies vertical growth for the country, saw residential apartments capturing all, save three per cent of the market. Boasting of several upcoming and proposed infrastructure enhancements, Navi Mumbai strode ahead of the other zones in bagging nearly one-third of the total supply of apartments. The Andheri-Dahisar region, too, witnessed a considerable stock of flats; however, it was way behind Navi Mumbai, capturing less than one-fifth of the total market supply. 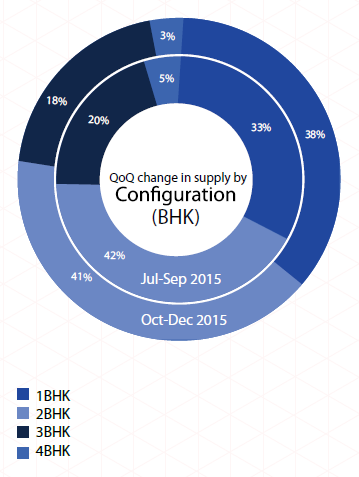 Of the limited supply of builder floors, Thane had the greatest bulk of this property type, appropriating a quarter of the total supply in Oct-Dec 2015. Navi Mumbai, along with Mira Road and areas beyond followed Thane closely on its heels. Occupying an insignificant share of the market, independent houses/villas witnessed maximum takers in regions beyond Thane. This property type was moderately popular even in Andheri-Dahisar and Navi Mumbai too. The prolonged lack of buyers has at last succeeded in altering the market dynamics of Mumbai. In the Oct-Dec 2015 quarter, the supply of affordable properties, which comprised properties within the price range of Rs 40 lakh, ousted luxury (Rs 1-2 crore) and ultra-luxury (above Rs 2 crore) housing categories from their prime positions. While almost a quarter of the market was captured by affordable properties (houses priced below Rs 40 lakh), the second largest supply was that of high-income housing, which includes houses within the price range of Rs 60 lakh - Rs 1 crore. Properties priced above Rs 1 crore captured a considerable 40 per cent of the market share, despite seeing a downward trending graph of 10 per cent when compared quarter-on-quarter. Following the usual trend chart, the mid income bracket, priced between Rs 60 lakh and Rs 1 crore, witnessed the lowest supply, although the segment’s market share grew insignificantly by a per cent from the Jul-Sep 2015 quarter to Oct-Dec 2015. Not surprisingly, South Mumbai took the lead in bagging the maximum supply of luxury and ultra-luxury houses, capturing almost 50 per cent of the total market. This zone was followed by Andheri-Dahisar which bagged two-fifth of the properties with a price tag of Rs 1 crore and above. Over 60 per cent of the properties in the affordable category was situated in Navi Mumbai. Thane, too, witnessed an almost equal share of reasonably-priced properties. 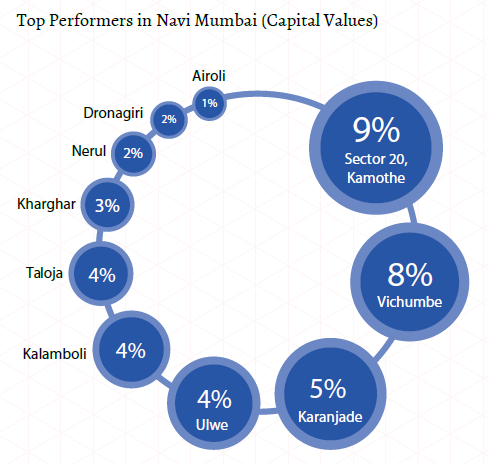 However, the two zones drew its uniqueness from the fact that Navi Mumbai featured most properties within the Rs 25-40 lakh bracket, while most houses in Thane and areas beyond ranged below Rs 25 lakh. Houses priced within Rs 60 lakh and Rs 1 crore were highly popular in Navi Mumbai, with the city capturing half the total share of the market. High capital rates and inequitable growth in income ensured that properties configured as 1BHK and 2BHK remained the most in demand. In fact, Oct-Dec 2015 witnessed a substantial amount of supply from the 3BHK and 4BHK unit categories spilling over to the 1BHK bracket, thus leading to a five per cent growth in the market share of the latter. 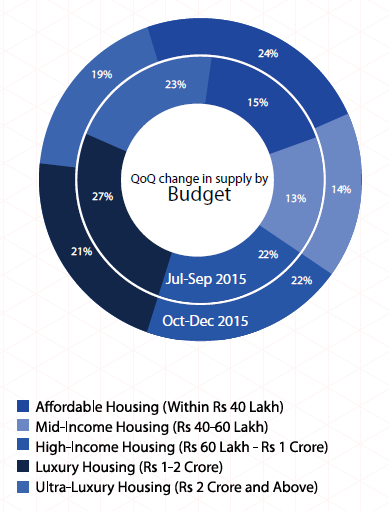 Even the 2BHK housing category saw an insignificant dip in supply from Jul-Sep 2015. Maximum properties configured as 1BHK and 2BHK, were located in Navi Mumbai, which hosted over one-third of the market in each category. Andheri led the market in the supply of 3BHK and 4BHK housing categories, capturing over a fifth of the total market share. South Mumbai, too, had a substantial share of 4BHK houses. In Thane, 2BHK apartments saw maximum takers, followed by 1BHK, which does not come as a surprise since the city hosts a lot of properties priced below Rs 25 lakh. Over 60 per cent of the properties in this region were configured as 1BHK. Thane is the only zone in Mumbai which did not witness demand for 4BHK units. Quite surprisingly, properties configured as 4BHK units did not curry favour with any region in Mumbai, although the category saw decent footfall in South and South West Mumbai. However, even in these two areas, 2BHK and 3BHK were the most preferred. Developers in Mumbai were increasingly focussing on completing existing residential projects, fixing their own businesses and capital flow in a bid to win back homebuyers’ trust and clearing unsold stock that has been troubling them for long. This trend is evident in the consistently dipping number of under-construction properties in the last three quarters, albeit minimally. 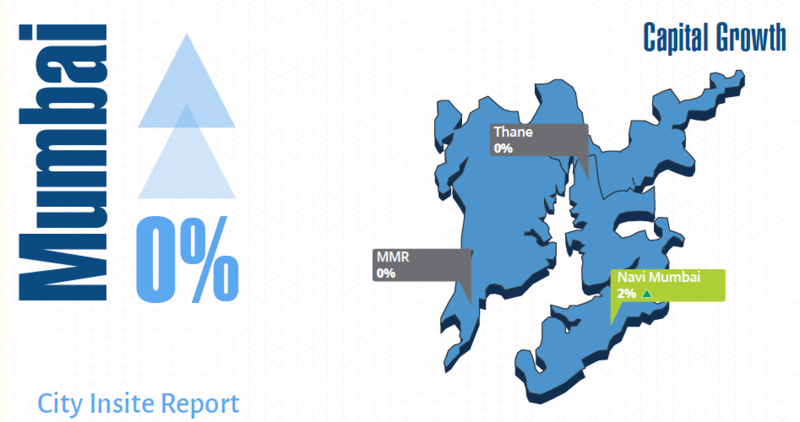 In comparison to all the other areas, South and South West Mumbai had the highest percentage of completed homes. 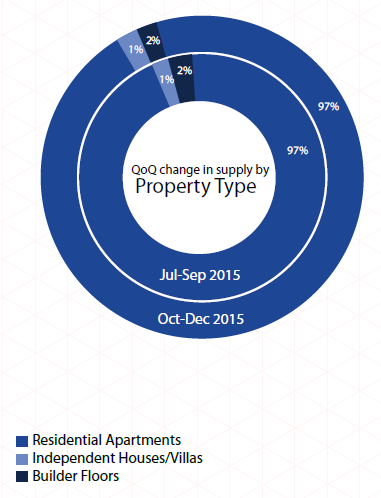 Over 70 per cent of the residential realty market consisted of ready properties. 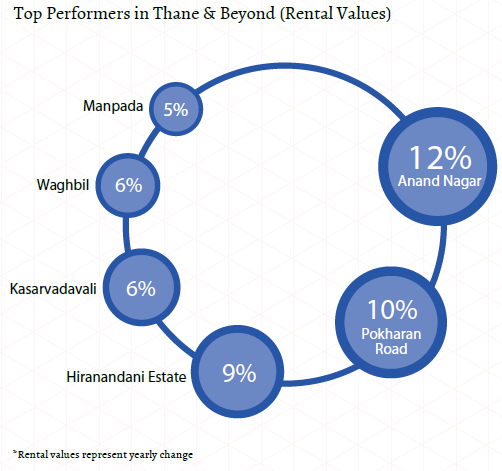 While Thane also witnessed two-third of its properties in the ready-to-move category, more than two-fifth of the market beyond Thane featured properties that are under-construction.